Festive Gift Guide Part 7: Daily Greatness! As regular readers know, I've been on a mission to be more organised since the new (school) year started in September. It's been going pretty well (see my two month review here) but there are areas for improvement. There are two particular things I want to work on next - one is having a 'vision' for what I want to achieve, and the other is striking the balance between what I have to do with what I want to do. In my search for answers, I kept coming across the following tool. A little basic research (a shout on on social media) showed that some of the entrepreneurs and all-round awesome people I admire already used them and would recommend them. Obviously I had to buy one to see if it would be a good candidate for the Festive Gift Guide. 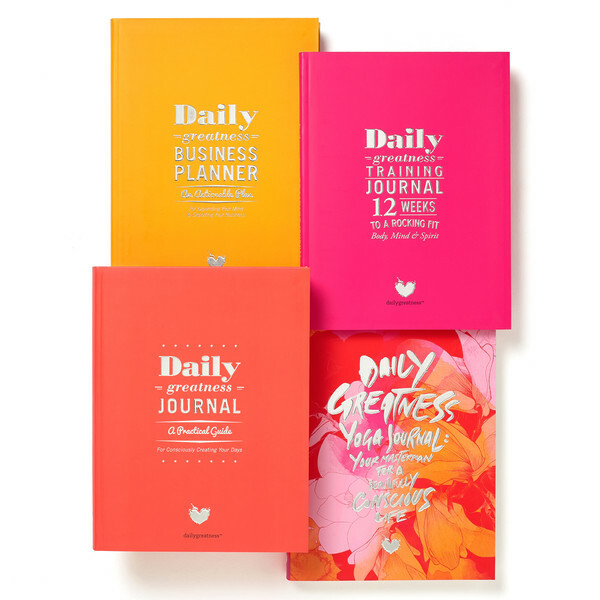 There are four different options to choose from via the Dailygreatness website or Amazon.com * - a business planner, a body and mind training journal, the (original) greatness journal and the Yoga planner. How we start our days determines how we spend our days. How we spend each day determines our future. What, then, is more important than beginning and ending each day with clear intentions, a positive focused mindset and conscious reflection? You've probably read a million self-help books but how do you apply those ideas and make lasting changes? 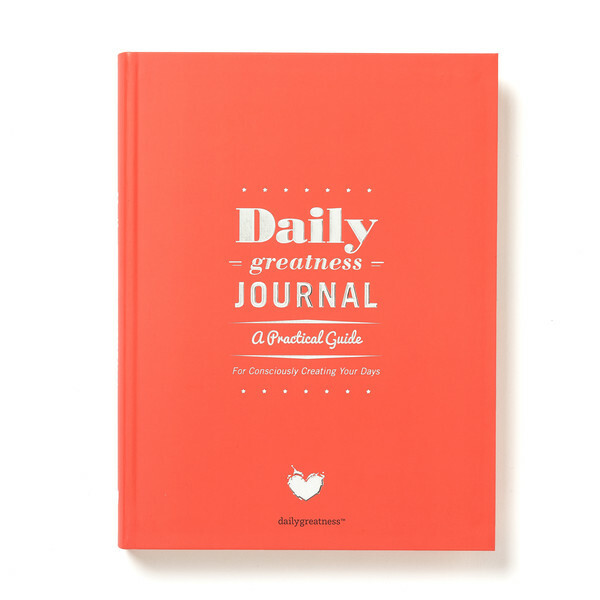 The Dailygreatness Journal: A Practical Guide For Consciously Creating Your Days, combines a yearly diary, goal and appointment planner, and daily tools for self-mastery. Designed to be used daily throughout the calendar year, the daily pages will guide you to form great habits through the 8 daily steps of meditation & visualisation, intentions, dream journalling, gratitude, evening self-awareness questions, exercise, inspired actions & inspiration. The weekly and quarterly check-ins keep you committed, accountable & motivated. With a yearly review that celebrates your achievements and highlights new opportunities for the coming year. Each stage laying the foundations for achieving self-mastery, reaching your goals and finding and following your purpose. The flexi-bound cover means the journal is sturdy and durable yet light in weight. The smooth matt finish makes it a pleasure to handle and the beautiful design, with 432 full colour pages, will inspire you to use it often. Inside, the premium quality paper is easy to write on with 2 silk ribbon markers for keeping your place. Caution! This journal if used everyday, could radically transform, profoundly shape and dynamically alter your destiny. Day-to-a-View Planner | Comprehensive Goal Planning System | Gratitude Journal | Weekly, Quarterly and Yearly Check-Ins | Weekly & Quarterly Goal Planners | Inspirational Quotes | Appointment Planner | Soul Clarity Worksheets | Prompts and Reminders for Staying on Track | Un-dated, so you can start anytime. WHAT I LIKE ABOUT IT: The journal takes a holistic approach to a 'life revolution' - goals are set for all aspects of your life - health/body, emotional growth, relationships, fun, work, money and community. But before setting any goals and working out your 'why' there are places to list the things you need to let go of or forgive to be able to move on. And a whole page to list your achievements to date - these are to refer back to when you're having a bad day! The content is great - I love the idea of 'creating' your life, rather than just living it. The exercises and questions may seem a little daunting at first (you have to face up to things) but the way it does this is really good, and while there is a structure to each of the daily pages, they are not exactly the same. By asking daily questions in slightly different ways, it makes you think! The regular check-ins are a great way to take stock of achievements and to reflect on everything before planning the next steps. WHAT I DON'T LIKE: The only downside to this journal is that it's too big to carry around in my handbag to have it with me all the time - which is not a deal-breaker as I'm usually at my desk anyway. The key is to making it part of a daily routine (morning and night) so that it's not missed. WHO IT WOULD SUIT: This is an ideal tool for anyone who wants to be more mindful and conscious of their life. It would suit someone who is interested in personal development, who wishes to improve their work/life balance, or who is simply looking for some direction with aspects of their life (this is me). It's not going to be for everyone - my husband, for example, would never ever think of using something like this (although as a self-employed freelancer, with huge career aspirations, and poor work-life balance, he would probably benefit from it enormously). 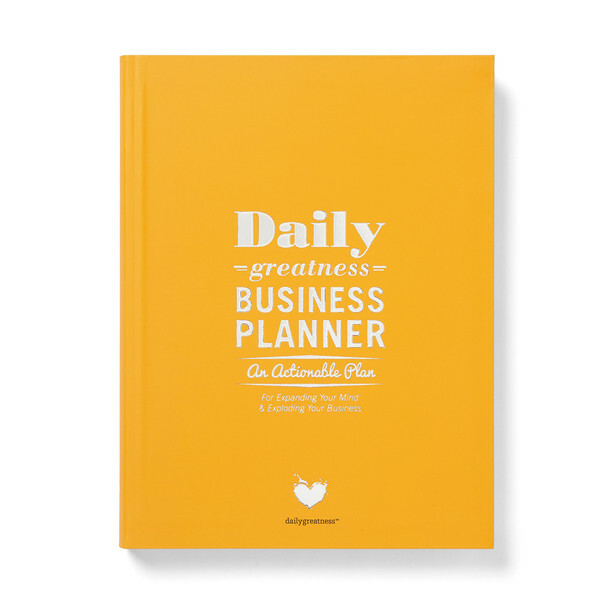 Arguably the most comprehensive business planner on the market, the latest planner in the Dailygreatness series is a must-have for your business. Encompassing everything you need to succeed in your business over the coming year, this planner is designed to upgrade your thinking while helping you hit your yearly business goals. With a unique combination of a yearly undated diary (you can start anytime), finance & budget worksheets, goal, action & appointment planners and the best personal development tools, distilled down into a simple daily, weekly & quarterly structure, this powerful tool will support you in creating the habits of a Peak Performer. Designed for optimal focus, personal growth and organisation, the week-to-a-view pages will guide you in forming excellent thinking habits while taking action on your most important priorities. The weekly check-ins, challenges, planners and inspiration, keep you firmly on track with your goals while the 90-Day high-level check-ins and challenges keep you committed, accountable & motivated. Each stage lays the foundation for staying true to your purpose as an entrepreneur, reaching your goals, expanding your mind & exploding your business. The flexi-bound cover means the planner is durable, yet light in weight. The smooth matt finish makes it a pleasure to handle and the beautiful unique full-colour design will inspire you to use it often. Starting your day with the Dailygreatness Business Planner will empower you to create your days in new and exciting ways, utilising your time effectively and enabling you to be the best entrepreneur you can be. As with anything like this, these tools are only good when you actually use them. I'm just getting started with mine, but I'll be sure to update you with how it's going over the next few months. And if you are already using any of the Dailygreatness journals, please leave a comment and let us know how it's going. NEXT WEEK: In part 8 of the Festive Gift Guide, I have something for the spinners, and wanna-be spinners out there, and it's a real feast for the eyes. Don't miss it! *Affiliate links - read more here.